Personal Protective Equipment – (PPE) has to be an integral part of our everyday workplace safety plan. Here is a review of some important facts about personal protective equipment while operating a chainsaw. 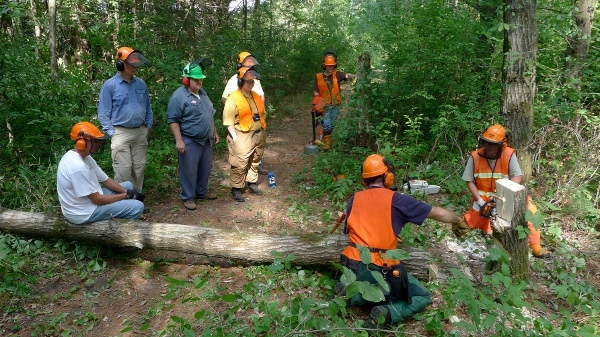 Most of us have probably been told – or at the very least heard about – the necessity of wearing proper personal protective equipment when we use our chainsaws. It gives us that last line of defense in preventing injury, or at the very least, reducing the severity of them. The most important items of ppe include a hard hat, hearing and eye protection, leg protection, and foot protection. Other types of protection out there include cut resistant gloves, and upper body protection provided by shirts and/or jackets that contain cut resistant materials. However, knowing what to wear is only half of the formula. Knowing when to replace it is equally important. Wearing defective or outdated equipment gives a false sense of security – not to mention inadequate protection when we need it. So here are some facts that need to be considered when analyzing the ppe we bring to the job every day. Hard hat– most manufacturers recommend replacement of hard hats after 5 years after the date of manufacture. Other factors that reduce the life expectancy of helmets include exposure to ultra-violet rays, marking on them with magic markers, placing stickers on them that are not approved to be placed on plastic (that would include almost every sticker available), dropping them on hard surfaces, cleaning with harsh chemicals, or drilling holes in them for ventilation. There is also a disclaimer that comes with each helmet that should be read to be sure all information available is covered. Hearing protection – ear muffs need to be maintained by removing the protective liners inside the muff and cleaning it occasionally. Also, the seal around the outside usually gets damaged in cold weather, so they should be replaced when damaged. Ear plugs also need to be replaced on a regular basis. Sponge type plugs should be replaced daily. Leg protection – leg protection needs to meet certain criteria in order to provide adequate protection. It is required that the equivalent of 4 layers of protection be used, and 6 layers of protection is recommended. Those layers must stay intact to provide maximum protection, so any time the inside layers of the protection are cut, the chaps or pants must be replaced. Patching them is not an option. They must also fit properly, so the protective layers must extend from the top of the thigh to the top of the work boot. We recommend they extend slightly over the top of the work boot for maximum protection. And they must be kept clean – so wash them according to the manufacturers recommendations, which are usually attached to the garment. Foot protection – work boots with cut resistant material and steel toes are recommended to protect our feet from chain saw cuts, and heavy objects pinching our toes. How many times has it happened that logs roll after they’ve been cut and our feet somehow get in their way? None of us want to get injured while on the job, and there are generally two ways to reduce that possibility – good technique, and good ppe. Proper training along with purchasing and maintaining good ppe will certainly keep us safer! !